The stock market took a body punch today. Should you sell everything? Let's take a look at two representative indexes. First up is the S&P 500. Check the red ellipse drawn on the chart. 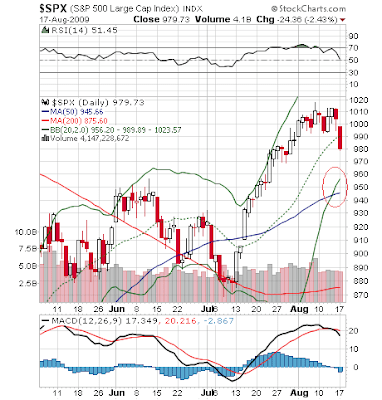 This ellipse highlights the area where there is a convergence of the 50-day moving average, the lower Bollinger Band and a short term support level established in June. In other words, this range from 945 to 955 should provide serious support for this important index. This next chart shows the NASDAQ 100. Here we have drawn a red circle and a blue ellipse. The red circle highlights the convergence of the 50-day moving average and the short term support level established in June, much as we saw above in the chart of the S&P 500. 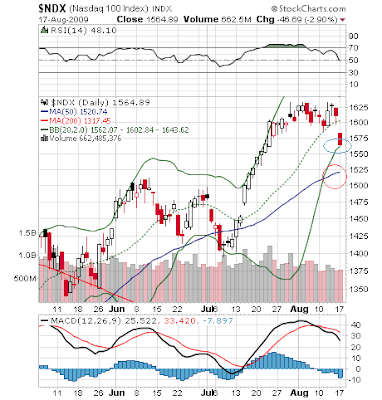 In the case of the NASDAQ, however, the lower Bollinger Band is higher than the previously mentioned indicators and the index has already slid pretty close to it. So the NASDAQ 100 has two support areas: the range from 1510 to 1520 and that range around the lower Bollinger Band at 1563. Volume on today's move was not particularly heavy. In fact it was less than on many of the days when the markets rallied and bears said the volume wasn't sufficient to confirm a real rally. As described above, there are significant areas of support that can be expected to limit the declines in the indexes we examined. This implies that losses will not be significant. Indeed, this could very well be a healthy pullback. Up-trends starting at the March lows have not been violated. With the enthusiasm of earnings season clearly waning, investors are looking to economic reports. Unfortunately, all we are getting are mixed signals: retail sales are declining while manufacturing is improving, job losses are declining but remaining stubbornly high, real estate hitting bottom but far from full recovery and so on. Say what you will, what we are seeing is not by any stretch the indicators of Armageddon. With respect to fundamentals, then, I would tend to give the benefit of the doubt to the bulls. So hang on to your stocks. Indeed, if the major averages respect the support levels described above, it would be a signal to buy.